(CNN) -- Sen. Edward "Ted" Kennedy didn't wear his faith on his sleeve, but those close to him say Catholicism was much more than an ethnic and cultural identity. 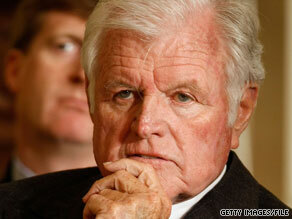 Those close to Sen. Edward "Ted" Kennedy say he was a deeply religious man. Kennedy's family chose Boston's Basilica of Our Lady of Perpetual Help, also known as the Mission Church, for his funeral Mass on Saturday. The church held a special significance for the senator because he prayed there every day when his daughter, Kara, was diagnosed with cancer. Kennedy died Tuesday night after a 15-month battle with brain cancer. He was 77, and had represented Massachusetts in the Senate since 1962. The Rev. Gerry Creedon, a priest at St. Charles Borromeo Catholic Church near Washington, counseled Kennedy for more than 30 years. He was chosen to deliver the opening prayer at Friday night's "Celebration of Life" memorial service. Kennedy not only attended Sunday Mass, Creedon said, but also sought him out to discuss the tenets of Catholicism. "Most people sat there either disagreeing with me or sleeping. I'd walk out of church, and Ted Kennedy would come up to me and continue the theme I was preaching on," he said. CNN covers the death of Sen. Ted Kennedy, including the memorial tonight and the funeral Saturday. Kennedy came from a famously Catholic family. His brother, John F. Kennedy, was the first Catholic to be elected president of the United States. Ted Kennedy often said it was his mother's Catholic faith that guided his family's political agenda. He used Scripture in his push to end poverty and discrimination. "My favorite parts of the Bible were always Matthew 25 through 35: I was hungry and you gave me to eat, and thirsty and you gave me to drink," Kennedy said at Esperanza's Hispanic Prayer breakfast in 2007. But his support for abortion rights flew in the face of the Catholic credo. "I think he would wish that he could have found a middle ground, a common ground with our church institution," Creedon said, acknowledging that Kennedy's stance on the issue was problematic with the church. "He received a lot of critique. I prayed for him at Mass yesterday morning, and I got an e-mail saying you scandalized the faithful by praying for Ted Kennedy." Creedon said Kennedy often came to him for spiritual guidance during well-publicized low points in his life. And in his final year, too ill to go to church, Kennedy asked Creedon to come give communion at home -- and never asked others to pray for him. "When it came to the prayers of the faithful, [that] is the time normally people make petitions. ... He never made a petition, but he always had two or three prayers of thanksgiving, gratitude," Creedon said. One of the last letters Kennedy wrote in July was to Pope Benedict XVI. President Obama personally delivered the note when he visited the Vatican last month. Neither the senator's aides nor the Vatican would disclose what the letter said.